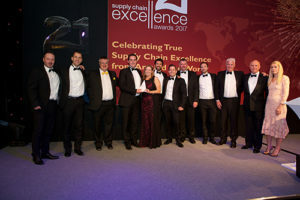 The judges are always keen to see high scores in this category – after all, customer service should be a core focus for any supply chain seeking excellence. They were not disappointed. Pladis UK was rated highly and impressed with its close collaborative strategy with KP. However, it was Gant with MIQ Logistics and Sainsbury’s Argos with DHL that were the two key contenders for the trophy. The entry from Gant with MIQ Logistics highlighted how the pressures of success can be relieved through outsourcing. In 2011 clothing brand Gant launched its ecommerce channel and it was an immediate hit. However, resourcing issues and dislocation from the physical fulfilment operation meant that the company struggled to answer customer queries, which had a negative impact on customer service feedback scores. In a forward-looking move, the business outsourced its customer service function to MIQ Logistics, which now handles over 20,000 customer enquiries annually, and has recently developed their role to encompass ‘virtual personal shopping’, encouraging VIP store visits and upselling. In addition, the team have delivered an initiative to transform the returns process, reducing costs by 20 per cent while improving customer choice. The judges were particularly impressed with the team’s resolution rate of 99 per cent and their collaboration with the client to work as one team. Although they fell short of winning the award the judges Highly Commended Gant with MIQ Logistics. From left to right: Mark Sim, General Manager North, DHL, Laurence Garnett, Head of Home Delivery, Argos, Jim McKechnie, Operations Director Home Delivery, DHL, Jim Hartshorne, VP Operations Home Delivery, DHL, Jen Barker, Senior HR Business Partner, DHL, Stuart Boyer, HR Business Partner, Argos, Tony Waddy, General Manager, Operations, Argos, Andy Palgrave, Operations Manager North, Argos, Greg Bacon, Home Delivery Development Manager, Argos, Paul Dyer, CEO UKI, DHL, Malory Davies, Editor of Logistics Manager, and host Sara Pascoe. Sainsbury’s Argos with DHL presented their project to completely change the focus of Argos’ two-man home delivery supply chain and delivery strategy, to meet the changing needs of its customers. The objective of this significant change programme was to support its multichannel, digital-led offering, providing more choice to customers, at greater speed. The two-man delivery network delivers everything from outdoor furniture to dining tables, treadmills and washing machines. A key part of the strategy was reinvigorating the Argos principle of putting the customer first. The home delivery supply chain team conducted a full end-to-end review of the two-man delivery operation, supported by other teams such as customer experience, IT and the digital team. The judges liked the dedicated approach taken to drive cultural change, with an emphasis on encouraging the whole team to impress and delight customers at every opportunity. The benefits to the company were clear to see in terms of customer feedback, and the initiative has enabled the business to offer next-day delivery on furniture across the country, which is a significant competitive advantage. This was a well-conducted exercise with proven results. The judges decided this was the winner and so the trophy for Customer Service & Support went to Sainsbury’s Argos with DHL.